I have to confess something. It’s big. I hope we can still be friends. I’ve been cheating on my favorite cinnamon roll recipe with these bad boys. I’ve made these rolls no less than eight times in the last couple of months and although I didn’t believe cinnamon rolls could get any better, these definitely are in the running for the best cinnamon roll. In my defense, I’ve only been partially cheating, using the tasty brown sugar filling from the “old” recipe and pairing it with the velvety soft and tender dough from this newer recipe. The result of the merge is near perfection, especially with the simple cream cheese glaze swirling over the tops of the warm rolls. The buttermilk dough is so soft and supple that a rolling pin isn’t even necessary when rolling them out (similar to the other vanilla pudding recipe) – I can easily press it into a rectangle with my hands without it being overly sticky. The difference lies mainly in the flavor of the dough. The buttermilk adds a special depth of flavor to the dough and must aid in tenderness because the baked rolls are fabulously soft and light in texture. 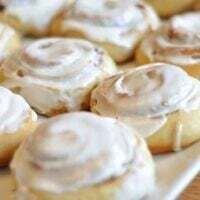 I have a feeling I’ll alternate between the two recipes, since I still absolutely adore the vanilla pudding recipe, but if you twisted my arm and pinned me down for a confession, I’d have to admit that these are definitely my new cinnamon roll flame. For the dough, add the warmed buttermilk and butter to a stand mixer fitted with the dough hook (or you can use a large bowl and mix with a wooden spoon). With the mixer running, add the eggs, sugar, yeast, salt and 1 cup of the flour. Continue adding flour, just until the dough pulls away from the sides of the bowl. It should be very soft but not so sticky that it leaves a ton of residue on your fingers. Let it knead for just 1-2 minutes until it has come together in a soft, tacky ball. Place the dough in a large, lightly greased bowl and cover the top tightly with plastic wrap. Let the dough rise in a warm place until doubled, around 2 to 2 1/2 hours, depending on the warmth of your kitchen (you can speed up the rising by placing the covered bowl of dough in a very lightly warmed oven). Meanwhile, lightly grease a 9X13-inch baking dish (if doubling the recipe, I’ve found using a large rimmed baking sheet, 11X17-inches, works great). When the dough is ready, turn it out onto a lightly greased counter and press it into a 16 by 12-inch rectangle (if you have doubled the recipe, split the dough in half and roll out one half at a time). Gently spread the softened butter over the rectangle, using an offset spatula or rubber spatula or just your fingers. Sprinkle on the brown sugar mixture, leaving a 1/2-inch border along the top and bottom edges. Lightly use the palms of your hands to press the brown sugar mixture into the butter, adhering it to the dough. Lift the longest edge closest to you and begin rolling the dough into a tight log. Pinch the seam closed and roll the log so it is seam side down. Gently stretch the log to be 15- or so inches in length with an even diameter all the way throughout and pat the ends to even them up. Using a serrated knife, slice the log into 12 evenly sized rolls (or more if you like your rolls thinner). Arrange the rolls cut side down on the prepared baking pan and cover with lightly greased plastic wrap. Let the rolls rise in a warm place until doubled, 1 to 1 1/2 hours; it's really important to let them rise well or else they won't be light and fluffy after they've baked. Bake at 350 degrees for 22-25 minutes, until the rolls are very lightly golden on top and cooked through but not overly browned. While the rolls are baking, mix the softened cream cheese and buttermilk together until smooth (I usually use a blender to make this glaze). Add the vanilla and mix. Whisk in the confectioner’s sugar. Add additional milk or buttermilk one teaspoon at a time until desired glaze consistency is reached. It should be thick yet pourable. Drizzle the warm rolls with the glaze. In place of the glaze, you can use this delicious cream cheese frosting! After making these for so many years and refining the process (and sometime getting frustrated with dry dough, depending on where I was living at the time and my elevation), I've totally changed the method for making this recipe. I know some of you love these the way they were, so if you want the original recipe, here's a downloadable PDF of the old recipe. I promise, though, this new method is much more foolproof. Make-Ahead: to make these rolls ahead of time, once the rolls are formed and placed on the baking sheet, immediately cover them with lightly greased plastic wrap and refrigerate them; do not let them rise. Refrigerate overnight, up to 16 hours. Let the rolls sit at room temperature, covered, until they have doubled in size about 3-4 hours and then uncover and bake as directed. The rolls can also be frozen at the same point as mentioned above (cover with a layer of greased plastic wrap and a top layer of tin foil). They will need to sit at room temperature for 9-11 hours to defrost and rise before baking. I've also found that warm 2% or whole milk works great in place of the buttermilk. As with all yeast doughs, I never use the flour amount called for in the recipe as a hard fast rule. Because humidity, temperature, altitude and a multitude of other factors can impact how much flour you need in your yeast doughs, I always judge when to quit adding flour by the texture and look and feel of the dough rather than how much flour I’ve added compared to the recipe. This tutorial on yeast may help identify how a perfectly floured dough should be. These are my favorite!! Is the downloadable PDF of the old version still available? I think I’m confused – what version are you looking for, Meghan? Oh, sorry about the confusion! Let me see if I can dig it up! These turned out so good! Made a double batch, baked in 4 round disposable pans so I could freeze some and share with friends. Just made this recipe today; we always have cinnamon rolls on New Years Day, and this year was definitely the best one! Thanks so much!!! Oh YUM! These were my first cinnamon rolls and boy were they delicious! The dough really is dream to work with! And then the glaze… Oh.my.godness.it’s.divine! The depth of flavour and the creaminess from the cream cheese. I nearly wept it was sooo good and I might or might not have eaten half of it on it’s own. Straight from the jar with a spoon. Incredible! Thanks you so much for this fantastisch recipe, Mel! Absolutely amazing flavor and easy to follow guidelines. However, mine turned out more like cinnamon swirl coffee cakes than cinnamon rolls? Not complaining, they tasted fantastic, but I am wondering what I did wrong. Too much flour? Did the butter mix with the dough too much when a spread it on (it was still a little hard)? Did not using a serrated knife to cut the log flatten it out too much? Would really appreciate any help you could offer, I’m still pretty new to baking bread. Hey Kris – can you give me a few more details about the texture? Were the rolls cakey instead of soft like a bready cinnamon roll? Yeah, exactly! they were drier and cakey and pretty flat compared to standard cinnamon rolls. Yummy! The cinnamon fillings are not overwhelming, love the texture and the glaze. These are amazing!!! My new go to. I didn’t have cream cheese and forgot to buy some so I still need to try the icing. I just made a glaze with the other ingredients and left out the cream cheese. One question that I posted elsewhere but I couldnt see where it posted on your website but are you using freshly milled hard white wheat flour in this recipe or are you using store bought all purpose white flour in it? Thanks so much! I love all your recipes!!! I read through most of the comments but didn’t see if anyone asked or tried to refrigerate after the 2nd rise and then bake in the morning. Mel, do you think that would work? My kids get up so early and are hungry! Yes, you can definitely do that! Just make sure the rolls have time to come to room temperature and double in size (they should rise a bit in the fridge overnight) before baking. Hope that helps! Have you published the nutritional facts per serving on this recipe? Thanks. I updated the recipe probably around October 2016. Mel you had me at your chocolate cake recipe . . . but now with the Cinnamon Buns! Wow. My boyfriend who can be so fussy and critical with food “inhaled” the bun licking his fingers in admiration of how good they were. Light & Moist. This was my first attempt at cinnamon buns and it was easy enough. Next time I will wrap it a bit tighter…was afraid as I mentioned it was my first time making anything as such. Excellent recipe.I lov your blog. I am an avid fan. Thank you for sharing. So happy you loved these, Kimmy! I love this cinnamon roll recipe! They get rave reviews every time! I saw in the comments that you have made the rolls and refrigerated overnight covered in greased plastic wrap? I want to make some for our Easter brunch tomorrow morning…in your experience about how long do they take to rise after they come out of the fridge? Thanks for all the amazing recipes!! Sorry, just read the “make-ahead” directions at the top of the recipe!! Got it! 🙂 Happy Easter! Sorry for the late response, Britany – they usually take a couple hours to rise out of the fridge. Did they work out? Mel– I’ve been looking for a buttermilk dough recipe to make monkey bread with. Is there any reason you can think of that this dough would not make a spectacular monkey bread? So so so so easy and so so so so good! I can’t believe I’ve never made these before in all my years trolling your site. They are going straight to the favorite list! Hey Mel! Quick question – I am going away for the weekend with friends and want to make these ahead of time (Thursday night) and then bake them fresh on Saturday or Sunday for everyone. Would these survive prepared in the fridge (but unbaked) from Thursday to Saturday, or would it be best to freeze them for 24 hours and then start to defrost. I know you suggest “up to 16 hours” in the fridge so thinking close to 36 hours is probably too long and they will get gucky…. Thanks! I think 36 hours might be a little long in the fridge so I’d suggest the freezing route. Good luck! I have only been baking a few months but think it is hard to believe you could make any better cinnamon rolls than these. We love cinnamon so I used an extra TBSP of Ceylon Cinnamon as well as added pecans to half of them. I had trouble with the filling coming out of the Orange rolls but this worked much better. I like pressing the cinnamon into the butter and dough. Next time I will use a larger pan as they really got big and clumped together in the middle of the pan. We normally don’t put a lot of glaze on rolls but this was so good I used every drop. Thought about trying the vanilla pudding rolls but when I looked at the ingredients on the pudding box, it contains sugar of course but a lot of stuff I can’t pronounce and don’t want to use so many things also labled artificial. Nothing artificial about this recipe and people will love it. Thanks again, Mel, good job as usual. I made these yesterday as a special treat for my husband. He was over the moon. They were so good, even though I made a bit of a mistake in baking. My rolls were so close together they ended up being too close – so the middle was not cooked at all in the 30 minutes. So, I had to stick it back in. Never mind – we got there in the end and it tasted fab. I trust your recipes – thank you! Hi Mel, – This is my first time commenting on any blog and I have to say I have visited 100’s and in my opinion yours is by far the best. Not only in content, but also in web design, layout and user-friendly ease. I visit daily and have for quite some time. I have made many of your recipes and there has not been one that I would not give 5 stars. I recently made Gloria’s cinnamon roll recipe with fabulous results. And I was wondering if you have frozen the buttermilk cinnamon rolls after baking in the same manner as Gloria’s recipe? What a nice comment, thank you so much! In answer to your question, yes, I have frozen these buttermilk cinnamon rolls the same as Gloria’s recipe. It works great – if I had to be super critical, I’d say that Gloria’s recipe stays just slightly softer when defrosted and warmed up but these are still tasty. You’re very welcome! I just made the rolls and put them in the fridge for the night before a second rise in the am. The dough is a dream to work with. Which is really nice, as I do it all by hand. I will let you know how I feel they compare to the texture of Gloria’s when I defrost one. Thanks again Mel! These were delicious! Made with active dry yeast and followed the directions exactly – they turned out perfectly. I’ve made 4 batches of these in the last week and I used regular yeast since i didn’t’ have any instant yeast at home and it turned out beautifully every time. Just thought I’d throw that out there in case anyone is in the same situation that I was. 🙂 By the way the roll are divine, I added an extra teaspoon of cinnamon to the filling and about 1 tablespoon of lemon juice to the cream cheese icing recipe and it’s perfect!! is there any way to make these raise faster (the wrm over method)?? without ruioning them? As long as your warm oven isn’t overly hot, it should work fine. Good luck if you try it. Hi Mel, i need to make cinnamon rolls for my husbands upcoming hunting trip. Would you think this recipe stays fresher longer, or your vanilla pudding cin roll recipe? I will need to make it Thur evening, and bake fri am, for the group to have sat and sun. Also does the buttermilk cream cheese glaze need to be refrigerated? If yes, I would need to do a differnet glze, for a lack of electricity. I know, alot of issues, but it would make him happy……..
Hi Karen – I think both recipes stand a good chance of being the same level of freshness by Sat/Sun if you are baking them Friday but if pressured, I’d say, go with the vanilla pudding recipe. Ideally they should be refrigerated with a cream cheese glaze so if that isn’t a possibility, you might make a regular powdered sugar glaze. Good luck! I’m no stranger to cinnamon rolls but these are the best I’ve ever made. My biggest problem with cinnamon rolls is that they taste great out of the oven but are dry the next day. These are even great the next day! Thanks, Mel! I’ve learned a few things that may help those having problems: in my dry climate and high altitude, 4 cups of flour is too much, so if you are in my situation, try starting with 3 3/4 cups. To the person who had trouble with the filling running out, you may have rolled them too thick (I did that once). Make sure to measure your rectangle before you spread on the filling and they turn out perfect. They take much longer to rise than regular bread, so if they aren’t rising, wait another hour or two. Hope my mistakes help others! I’ve made these rolls many times and love them! I would highly recommend to the readers to use the instant yeast as stated in the recipe. All I had on hand yesterday was my active dry yeast. I proofed it before adding, so I know if was activated, but the dough just didn’t rise the same as with the other yeast. It took longer to rise and it never did get big and fluffy(?) like my rolls had in the past. Tasted good, just not comparable to what they have been in the past. Also, to add another dimension of yumminess I brown the butter for the filling as well as in the frosting- I use a browned butter cream cheese frosting!! I just made this recipe for the first time. I doubled it. And by the time it came together, it was definitely overfloured. It wasn’t tacky at all. I probably should have weighed the dough, especially since I was doubling the recipe, but didn’t. Is there any way to reclaim the dough once it has been overfloured? I tried adding additional buttermilk, but it didn’t really seem to work. And then my mixer burned out as I was trying to reclaim it:(. Do you have any suggestions for reclaiming overfloured dough (esp in a recipe like this where you put the flour in the mixer before adding the liquid)? In the future when doubling this recipe should I leave some of the flour out before adding the liquid? Michelle – oh no! In the past, if I’ve overfloured, I drizzle in hot water a tablespoon at a time and let it knead until the dough is soft and tacky again. If you dare make these again, I would start with quite a bit less flour, especially if you aren’t weighing it, because you can always add it later, but like you (and I) have experienced, it can be hard to rescue overfloured dough. Sorry about your mixer! Oh.my.goodness.gracious! Just made these for General Conference brunch and they are hands down the best cinnamon buns that have ever crossed my lips! Thank you so much! I cook or bake off your blog probably 4 times a week! 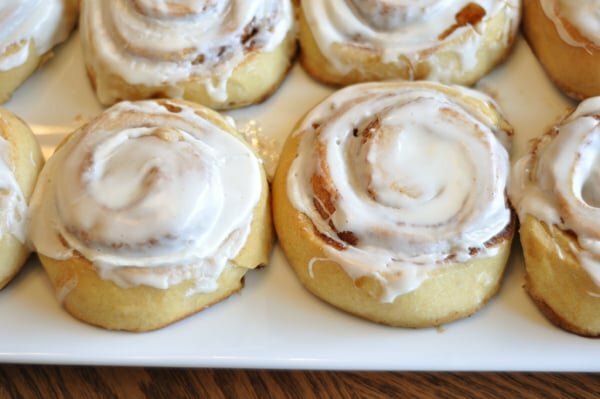 These are the best cinnamon rolls I’ve ever made or had. If you are an internet surfer looking for a recipe, look no further. Make these now. They are heavenly. I used active dry yeast instead of instant and lemon juice in milk instead of buttermilk. They are light and fluffy and melt in your mouth when fresh out of the oven. My only other comment to others would be that if you make 12 from the recipe and bake them in a 9×13 dish, they will not look like your picture. At least mine didn’t. They were squished and uneven, but delicious. I would love some photos (or at least numbers) of how you space them out (do you put 24 rolls on one 11×17 baking sheet?) and how they look before and after rising. Thank you, Mel for the great recipes and all the help. Amy – I will definitely take pictures next time I make them but I usually put about 12-16 on a large rimmed baking sheet because I like them to be just barely touching, not squished. Good luck! I’ve been making heart cinnamon rolls for Vday for the last five years and have used a different make-ahead recipe every time…. but this is the one I’ll use from here on out! They were so delish– rolls were soft on the inside but had a nice crust outside. I made them up last night and had a sweet and easy morning. Definitely a keeper. Thanks Mel! Could you make (and bake) these the day before and somehow heat up and glaze when you are ready to eat? I’m thinking Christmas morning!! Thanks! You are my cooking hero. I love your blog! Rebecca – I’m sure you could do that – I like to shape them, put them on the pan, cover with greased plastic wrap and refrigerate overnight and then take them out the morning of for a quick rise and bake so they are fresh and warm. But I think you could gently reheat the baked rolls and save even more time! I’m very excited to try these out! I absolutely adore your recipes and have made so very many of them! Do you think that there is any way that you could make these ahead of time and like freeze them or something? McKinlay – there are some tips in the comment thread but yes, you can make these ahead of time and freeze or refrigerate. Good luck! I am hoping to make these for Friday morning after Turkey Day! Sounds soooo good! Hope they come out as yummy looking as your pics! I love these rolls. They are the first ones to really come out well when I make them. But when I make them at least half the filling melts and puddles while they are rising, and then they are swimming in butter and sugar. Is it normal for a lot of the filling to come out? The rolls end up being kind of steamed/boiled because there is so much liquid. I roll the dough to a 16×20 rectangle (I measure it!). I actually use less butter than the recipe calls for. They end up being very wet and extremely messy. Delicious, but messy and not pretty. Any ideas? Kim – hmmm, that is a bit odd. Some of the sugar/cinnamon/butter mixture leaks out when I make them while they rise but not so much that they are steaming in the liquid. The sugar is probably what is liquifying when they are rising so if anything, you might try cutting back on the sugar amount a bit (if anything you could reserve some of the sugar/cinnamon mixture and sprinkle it on mid-baking or right before they bake). Let me know if that works any better. Mel, I don’t mean to be dramatic but these cinnamon rolls are life changing!!! Wrong. These cinnamon rolls of yours might be one of the best things I’ve ever tasted! Don’t tell my family but you got me converted! Hi Mel:) I made these tonight for our after-Priesthood-session treat, and they were AWESOME! I did everything as written, although I only got about 1/4 cup of butter spread on the dough and didn’t use the rest, as it was completely covering all the dough. I have never worked with an easier dough, either. Just like you said, I could spread it out with my fingers. Beautiful! Thank you thank you for your hard work with all these recipes. We eat food from your blog 3-5 times a week. We always love everything. Thank you! I just made these for breakfast and they were the best cinnamon roll I have ever eaten!!! You’re blog has inspired me to embrace baking yeast breads and now I’m a little obsessed…I’ve made your breadsticks and lion house rolls as well and everything has turned out perfect! Also, to all those out there who don’t have fancy mixers…I use a bowl, wooden spoon, and my hands and it’s still very easy! Thanks for this awesome website (I’ve also made lots of other recipes but this is the first time I’ve commented). Oh my….. Delicious! They were all gone (ALL 14 of them!) before I was able to make the frosting! Jennifer – yes, I make them with 1/2 white wheat flour all the time. I just realized it is Teacher Appreciation Week at school and there is no better way to thank someone than to bake them something from your blog! I, too, love the pudding rolls, but with buttermilk already in the fridge, I decided to give these a try. Unfortunately, while I had buttermilk, I was running out of flour, so mine have a mix of unbleached white, white whole wheat, and bread flour! And you know what, the rolls are absolutely awesome! (We HAD to taste-test them, right?) My dough was a breeze to work with as well. PS I do normally use floss to slice, but this dough is so forgiving, a sharp serrated knife was all I needed. Mel, how successful do you think it would be if I tried making this recipe using freshly ground whole white wheat instead? What changes do you think I would need to make to the recipe to accommodate the heavier flour? Hi Juliana – really, you just nee4d to judge the dough based on the feel of it so throw out the flour amount in the recipe and add the white wheat flour gradually until the dough is soft and smooth (keeping in mind that it will absorb more flour as it kneads, so you might err on the side of underflouring to begin and add more as needed). I’d also increase the kneading time by 5-6 minutes. Should turn out great, especially if the dough isn’t overfloured. I was just looking around for a recipe to help me use up some buttermilke. Can’t wait to try these tomorrow! Pinned! I have seen the America’s Test Kitchen recipe (LOVE THEM!) and I always trust their recipes implicitly. These look perfect! Instead of using a knife is used floss and it worked perfectly with a clean cut! I just realized how many times you have answered the pretty much the same questions regarding this recipe. You don’t have to respond to my original comment:) I will read the rest of the reviews of others who had difficulty with the dough rising. :):) Thanks for the tutorial too. I read it before making them, just don’t know what I did wrong! :( I will be working this out somehow, someway because I know how good they are! I WILL figure this out! I made this fantastic recipe for the first time about 1 1/2 years ago. It was amazing!! Since then, I have attempted it 2-3 times and it has failed miserably:( So, I want to ask a couple of questions to see if I can figure out why.. Instant yeast? I didn’t see any at the grocery store labeled this way, so I used Quick-rise. Is this the same? Also, I used the packets that say the measure 2 1/4 tsp yeast. Do you typically use the premeasured packets or out of a jar and measure it yourself? Would not kneading it long enough make it not as moist? I don’t think it rose as much as it did the first time I made it. I only used 4 cups of flour…but maybe that still was too much? Also, do you think it matters what kind of brown sugar you use? I used golden.. I am at such a loss:( I LOVED this recipe the first time I made it and I KNOW how good these bad boys are! All that work for dry rolls. Boo. However, I could eat that entire bowl of cream cheese frosting!! These cinnamon rolls were excellent. I followed the recipe to a T. I was in a hurry so to speed up the second rising I turned my oven on warm (a little over 100F) and just kept them in there for about half an hour. Mel…I am happy to say that I have found two new “go-to” recipes on your website this WEEK! Your sugar cookies and these! These were soooo good. And, I have to say, I cheated a little. I was in a hurry and needed them done quick. So, I added 3 tsp of instant yeast and skipped the first rise completely. I then shaped them, put them in a pan, and let them sit for about 1.5 hrs. We baked them and ate them warm and my husband was mmmmmming with every bite. I’m not gonna lie…I was too 🙂 Thanks for another great recipe! Christina – I’ve frozen them for 1-2 months with no problems. How far in advance can you freeze them? I have these rising right now…was looking for a new recipe for cinnamon rolls and your site was the first place I checked! The dough looks and feels gorgeous, can’t wait to have these in the morning! Mel I have been craving some good cinnamon rolls and whenever i have a craving i come to your site. These look great, but i have tried them twice and they just aren’t rising. I can’t find instant yeast anywhere, do i have to go to a special store? So i tried it with active yeast. Do you have any suggestions on how to get it to work? Amanda – when you make them with active dry yeast are you proofing the yeast first? If not, that is the main reason why they are not rising. You can usually find instant yeast under the title “Rapid Rise Yeast” – it is the same thing as instant yeast and I’ve seen it at all of my major grocery stores. If you don’t have it and don’t plan on buying it, simply let the active dry yeast proof in the warmed buttermilk before adding it to the recipe (by proofing, I mean, whisk it into the buttermilk in that first step and let it foam and bubble which could take 5-10 minute before proceeding). Good luck! Hi Mel!! I made a double batch of these for a family brunch! Everyone loved them! I followed your recipe and didn’t make any changes but I think next time I’m going to add pecans!! I had to knead the dough by hand because a double batch is to big for my kitchen aid to handle. Oh well! They still tasted great!! Thanks for sharing! Not that you need any more validation, but I’m working on these buttermilk rolls for the third time (I make them every Conference, starting with your vanilla pudding ones originally). Every time I make these I’m reminded how much I love the dough this recipe makes. Seriously, every 6 months the phrase “this dough is such a joy to work with!” runs through my head. Maybe next time I should remember to knead by hand, just to enjoy it even more. And of course, the final product is delicious! Can’t wait to make these, but am having trouble with all of my bread dough lately. I use active dry yeast, and am unsure of how “warm” the liquid should be to proof my yeast. It calls for warm buttermilk in this recipe- do you have a general temperature that I cam shoot for. And maybe I should just use instant yeast- is that what you would recommend? Thanks Mel! Angie – I never use a thermometer to judge the temperature of my liquid but in this recipe, when I warm the buttermilk, I swirl it around with my finger and make sure it feels fairly warm to the touch but not hot enough that I have to pull my finger out. I always use instant yeast. I think it is a little more foolproof than active dry yeast but you should be able to use both in this recipe. If you are still troubleshooting yeast recipes, even with instant yeast it would be a good idea to let the yeast proof (even though you technically don’t have to with instant) just to make sure your liquid is the right temp to activate the yeast. Let me know if you have any other questions! Made these today with my 13 year old niece. Best cinnamon rolls EVER!! THANK YOU!!! I made these this weekend and it was probably the best dough I have ever worked with and the final product was amazing. Huge hit with my house guests. Thanks for sharing! These are great! I just finished a batch. I was able to reduce the amount of butter and sugar and they were still delicious and moist. Mel, I just know when I want to make something and it’s on your site it’s going to be awesome. I had this fear of yeast, but wanted to try cinnamon buns. I bought the active dry yeast thinking that of course that’s what you’d use, and then ended up in panic mode when I discovered you don’t! However, your tutorial on yeast was so reassuring, especially as your pictures matched exactly what was happening to me in real life, so I carried on and was pleasantly surprised with the ease with which this recipe came together. I can’t say enough how much your teaching with photos works and is so quietly encouraging. I let go of being so stringent with my usual mindset of “the recipe says knead for 18 minutes”, when at 12 minutes my dough looked like your photo of being just right. I followed instinct that it would be right, and they turned out better than I could have imagined. Thank you, thank you thank you! I think I like these more than the vanilla ones. I have made both and prefer these! This will be my go-to-recipe from now on! Since I don’t have a stand mixer, I was wondering if this dough could properly be made in my bread machine. Hi Brenda – yes, as long as your bread machine is large enough to accommodate the ingredients, it should work just fine. Anyway, as you can tell from all my waxing poetic, I will definitely be making these again, but probably not till Easter…my waistline is in enough trouble as it is! I love baking but had never tried cinnamon rolls until I came across your recipe! They were the biggest hit! This is definitely going to become a staple in our house! Looking forward to making these for my family this morning, thank you for an amazing recipe!!! As you recommended and they were so good. The perfect way to celebrate the new year! bdubz – THREE batches? You are amazing! Hey Mel! Made these AGAIN this weekend! They are just soooo good! I was wondering, do you put them all in one pan or spread them out? I have been speading them out about two inches apart, so I end up using 2 pans. I don’t know if that effects cooking time or not, but mine are always done in 10-12 minutes. What am I doing wrong? Are they better if you cook them all next to each other? Thanks again for this fabulous recipe! Allie – I bake them either way, depending on my mood. But yes, they will bake a little bit faster if they are spread out since the surface area for baking is more exposed, versus being smooshed together in the pan, so I don’t think you are doing anything wrong! I like them both ways – when baked closer together the middles and edges are gooey and soft but they make for a nicer presentation if they are baked with some distance inbetween since they can be served individually without having to saw them apart. I made these over conference weekend and they were fabulous! I think this is going to be my go to cinnamon roll recipe. You are just always improving my life, Mel! Melissa – I can honestly say I like the glaze and frosting equally. If you are nervous to try the glaze then by all means use the cream cheese frosting from the other recipe. You’ll love it either way! I’m scared, and I might just babble and not make sense. But I will try these. I just love the vanilla pudding ones sooo much. But for some reason I’m mostly scared to make the glaze instead of the cream cheese frosting. I haven’t baked too much and so when I see less ingredients my mind feels like it’s “downgrading” in disguise. So since you confessed secretly liking these more, what would you say about the glaze vs the frosting??? Is it a must for THIS version? Does it just “match” better? I’m sure they are both fine, but I feel scared to try the glaze! I can’t imagine EVER converting over to another recipe! These were perfection! I finally made these and wow! Perfection! We loved them and my husband rated them an A plus! The dough was really easy to roll up and cut into rolls. I’ve never made cinnamon rolls that looked or tasted this good! Thank you SO much Mel! Kensi – perfection is a good thing! Glad you loved them. Something about Conference brings about baking apparently! Add me to the list that made these this morning and snarfed down two. The dough was a dream to work with. Perfection! Heather – I was thinking the same thing! Cinnamon rolls were popular this weekend. Glad you loved these, too! Jen – glad this cinnamon roll is your new favorite! Thanks so much for checking in and letting me know. I just made them for conference too! This was my first attempt at cinnamon rolls ever–I think I’ve shared with you my fear of yeast. But they were perfect. I mean, really. I looked like such a super star when I served these to our guests this morning. You always make me look so good Mel! I twisted the glaze around to make an orange glaze by adding orange zest and orange juice in place of the buttermilk. It was the perfect combo. I am no longer scared of yeast (well, mostly) and this has been declared a new conference tradition. This dough is amazing. I got up this morning at five so we could have these fresh for Conference, and I can tell it will be worth it. (I realize I could have made them ahead of time but figured I would still have to get up to take them out to rise, and once I’m up -I’m up so…) I think we have just started a new tradition! Thanks. And my son thanks you too, for letting him have “treats” for breakfast. I can just hear him now 🙂 Thanks for helping my feel like mom of the world, if only for a moment! Kira – the dedication of a mother who wants to provide cinnamon rolls first thing in the morning! Seriously. Five a.m. for anything is a labor of love in my home. I’m glad they worked out to make it worth your effort! You deserve mother of the year award for this. I don’t need to wait to taste these before I leave a comment…right now they are almost ready to put in the oven and I can already tell they will be FAB! The dough looks incredible. Thanks for the great recipe! We love so many of your recipes. Can’t wait to eat them during Conference tomorrow. Marne – hope these rolls were great out of the oven, too! Thanks for your comment. Melanie….these were AMAZING! Made them this past weekend for our family and some friends at a lake house, and they were gone the next day. They were the fluffliest lightest rolls ever! Would you ever use that new perfect frosting on them? Or is that recipe mainly for cakes? What about on sugar cookies? I am dying to try that frosting! I am thinking since I still have buttermilk left, I better make those rolls again for conference! Thanks once again for something AMAZING! i feel like supple is a dirty word, but i do love a supple dough. and yay–a new cinnamon roll recipe to try!! Okey doke! I’m adding this to the flour frosting recipe. It’s been a while since I made the kiddos cinnamon rolls. Mel, these were delicious. The proportions on the filling reminded me of the recipe for Cinnabon where I worked in high school. I especially liked how easy the buttermilk dough came together. Have you tried using the dough recipe for your yummy orange rolls? I’d be curious to see how it worked. Thanks for sharing. Beth – funny you ask, I actually made orange rolls a few days ago with this recipe and oh my, they were absolutely divine. I’m going to be posting about them soon! these are soooooooooooooooooooooooooooooooo good. i can’t even find enough adjectives in my vocab to describe them so i’m not gonna try. just awesome. Love that you love them, Mia! these sound SO good! i have to give these a try sometime soon!! 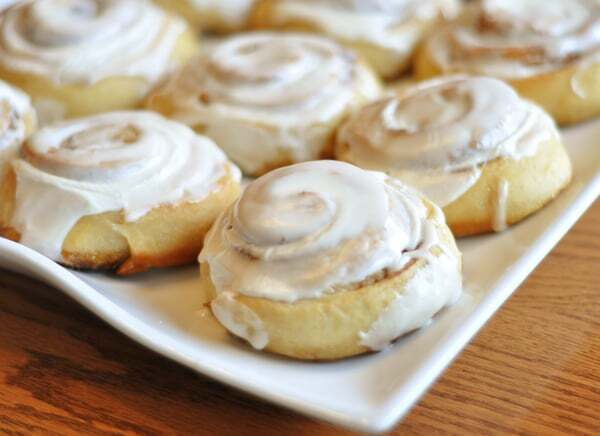 I love, love, love this cinnamon roll recipe and it is so easy to make. I am a big fan of your vanilla pudding cinnamon roll recipe but I think this one is my new go to cinnamon roll recipe. Between my daughter, son, husband, and myself we had all of these rolls gone within a day and a half. Yummy! Julie – you and me, both! I’ve converted over to this new recipe for now – love it! And I’m glad you do, too. Thanks for letting me know! Cassie – I’ll have to experiment with a pecan roll version. My husband doesn’t love nuts so I usually don’t use them a lot but if I come across a great recipe, I’ll let you know! Welcome back to the States! My mouth is practically watering all over my keyboard looking at these photos! Combining the best aspects of different recipes is one of my favorite types of kitchen experiments. Oh man, really? It really beats the other one? Thanks for posting this now too, we’ve made your cinnamon rolls for the last 2? 3? Conferences and it’s now the tradition! I’m glad I don’t have to wait too long to try them! It’s a cruel world!! I want to make these and about a trillion other things are your website that require buttermilk, but I can’t find that here. Is there anyway to make your own buttermilk? Kensi – yes, you can actually make your own buttermilk. Place a tablespoon of white vinegar or lemon juice in a liquid measuring cup. Add enough milk to bring the liquid up to the one-cup line. Let the mixture stand for five minutes then use as directed in the recipe. I hope that helps! these are rising in my oven right now 🙂 oh sweet heavens how will i wait 2 more hours to try one????? Ooo I bet the buttermilk really does give these cinnamon rolls a nice flavor and texture! Can’t wait to try these. I’m excited! Thanks so much for this recipe and for all the ones you post. I can ALWAYS count on Mel’s recipes to be winners! Thanks again! 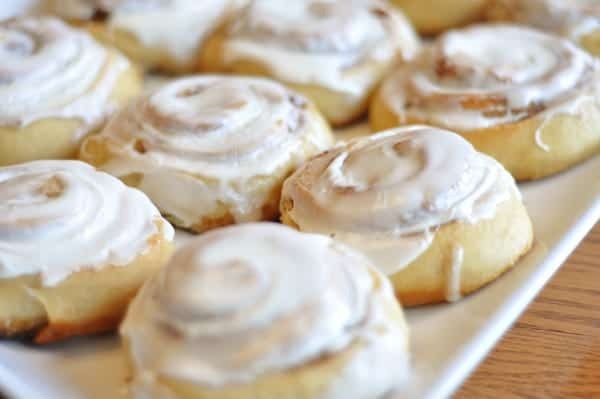 I’ve been wanting to find a better cinnamon roll recipe, and I am going to give these a try… just as soon as I can find people to eat the other 11. I freeze cinnamon rolls individually…..reheat in toaster oven when my sweet tooth overwhelms me. Is the instant yeast different than the active dry yeast? Can I use the Active Dry Yeast instead? Jenny, yes, the instant yeast is different than active dry yeast. You can look at my tutorial on yeast for some more information, but in a nutshell, active dry yeast needs to be proofed in water and a bit of sugar, usually, before being added to the other ingredients. Instant yeast, on the other hand, doesn’t need to be proofed first and can be thrown in with all the other ingredients without bubbling/foaming in warm water first. If you want to use active dry yeast in this recipe, increase the amount of yeast to 1 tablespoon and whisk in the yeast with the warmed buttermilk. Let it sit for 5-7 minutes or so until it bubbles and foams. Then mix in the butter and proceed with the rest of the recipe (omitting adding the yeast with the other dry ingredients). I hope this helps! Wow, these look sooo good! I am in need of new baking sheets. Just curious, what do you use? Angie – I use the classic 11X17-inch rimmed baking sheets – you can find them anywhere from Walmart to Sam’s Club to who knows where else. I use them for just about everything – all of my rolls, cookies. I am a big fan of cream cheese icing…those look divine! Darnit, I’m going to have to make these now. I have buttermilk that is going to expire soon and nothing else to do on this rainy day. Really, my hands are tied . . .
One problem I have with cinnamon roll recipes is that there is so little cinnamon! I like to know its there. I’m going to give these a try and will let you know my “expert” opinion. I also am a firm believer that the law requires raisins. I’ll let you know if I get to agree with you about the best part. I love baking with buttermilk, also agree on the brown sugar filling. Toasted pecans thrown in there would be my taste bud choice! I’ve been boycotting your blog in my attempt to shed the last of my pregnancy pounds (can I even call it that now that my baby is 19 months?). I tried to not exclude you there for awhile, but you are too much of an enabler! I’m reading all the recipes I’ve missed and I think I might be in trouble. The cinnamon roll recipe I use has buttermilk in it. It is perfect in sweet roll dough, I’ve decided. I’m going to have to give your recipe a try. I need to take a treat in to a friend and this will be perfect! I just bought some buttermilk at the store and needed a recipe to use it up. I am making these this weekend! Thanks!! Wow…these look incredible! I love that they can be made ahead. Thanks for sharing! mmmm… anything with cream cheese on it must be good!